Today is a good day for anyone who deplores dangerous confidence tricksters. In particular it is a good day for Ben Goldacre, and for the Guardian which defended him at potentially enormous expense. Matthias Rath, the Dutch (or is it German) vitamin salesman has dropped his libel action against the Guardian. He is the man who is, without doubt, responsible for many deaths form AIDS in Africa, as a result of peddling vitamin pills as cures. The action was taken after Goldacre said, in the Guardian, that Rath aggressively sells his message to Aids victims in South Africa that Rath vitamin pills are better than medication”. Fall of the doctor who said his vitamins would cure Aids – from The Guardian, with a video of the villain. Goldacre’s Badscience blog article on his victory . Leader from The Guardian . Profile of Zackie Achmat – from The Guardian, Mr Achmat is the founder of the Treatment Action Campaign , instrumental in exposing Rath. Extract from witness statements from the defence in the trial . And a lot of publicity from Gimpyblog (“Ben Goldacre and The Guardian triumph over murderous Matthias Rath”), Holfordwatch , Quackometer and jdc325 blogs. take my word for it. They say so themselves. They love to use imaginary words like “detoxification”, and, much more dangerously, they love to pretend that they can cure diseases by changes in diet. As long as you buy from them a stack of expensive “supplement” pills, of course. That means they are selling medicines, but by pretending they are selling food supplements they manage to evade the law that requires medicines to be safe and effective. That will not be so easy under new legislation though, and we can look forward to a few prosecutions soon. Guess who runs an “Honours BSc degree” in Nutritional Therapy. No prizes for realising it is the UK’s leading university purveyor of woo. We don’t know much about what is taught on the Nutritional Therapy course because the University of Westminster has refused repeated requests to say (but watch this space).. One can only assume that, whatever it is, they are not very proud of it. It seems a little unlikely that they will go as far as Matthias Rath and claim to cure AIDS -we’ll just have to wait and see. Meanwhile we can get an inkling by looking elsewhere. Course leader, Heather Rosa, pops up for example, on the expert panel of a web site called Supplements Compared.com. “Supplements Compared is designed to help you find the best dietary supplement product for your health needs.” And what sort of advice do you find there? 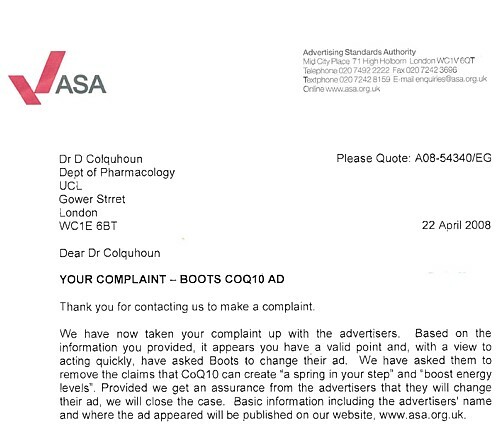 Try the page that compares 10 brands of CoQ10 (that is the stuff I wrote about recently, in “Boots reaches new level of dishonesty with CoQ10 promotion” – their advertising was deemed improper by the ASA ). It isn’t a recommended treatment for anything at all, but you certainly wouldn’t guess that from what is written by the ‘expert panel’. The winners are, according to the ‘expert panel’, Boots’ CoQ10 and Holland and Barrett’s CoQ10. Winners? Perhaps the explanation for that comes elsewhere, under “How are we funded?”. “Manufacturers who are awarded “best product” and “worth a look” are given the opportunity to promote this fact throughout the site for an additional fee.”. Well well. you are at risk?“. Never fear; buy enough vitamin pills and you’ll be saved. Her home page makes some pretty drastic claims. There is, in my view, not the slightest bit of good evidence that swallowing vitamin pills can benefit most of these conditions. But at least the list doesn’t contain AIDS, so is all this really relevant to the case of Matthias Rath? Yes, I believe it is. The University of Westminster may well not support the views of Matthias Rath (they won’t say), but we have heard no choruses of protests about him from any nutritional therapists, as far as I’m aware. There is no mention of him at all on the web site of the British Association of Nutritional Therapists (BANT), the UK club for these people. BANT, by the way, has a rather curious code of ethics. It allows its members to take undisclosed financial kickbacks for the pills they prescribe to patients. If doctors were caught doing that they’d be struck off the register. It is the existence of degrees in subjects like “nutritional therapy” that gives the subject a spurious air of respectability which allows seriously dangerous people like Rath to flourish with very little criticism. In an indirect way, the vice-chancellors who allow it to flourish (and Universities UK who do nothing about it) must bear some small part of the responsibility for the deaths of thousands of people from AIDS. It is about time they did something about it. ANH. The first reaction from the supplement-peddling industry comes from the Alliance for Natural Health on 16th September. It contains not one word of condemnation for Rath’s murderous activities. It’s hard to believe how low they will sink. The Prince’s Foundation for Integrated Health remains totally silent about Rath. HRH’s concern for health seems to dry up if things don’t suit his views. The British Association of Nutritional Therapists shows it’s total irresponsibility after a letter was sent to them to ask about their reaction. Their answer , on jdc325’s weblog was “The association has no opinion to offer on Dr Raths vitamin trials.”. Boots agreed to this request, so no full investigation will appear. That’s a win for reason, up to a point, but it also shows how toothless the rules about advertising are. Boots launch a big promotion with advertisements that are simply not true. The promotion is over and they got clean away with it. All they get is a little publicised rap on the knuckles and no doubt they’ll do the same again next time.